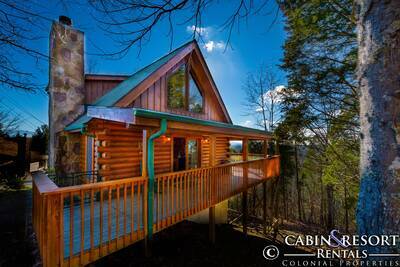 Welcome to A Beary Nice Cabin in Pigeon Forge! 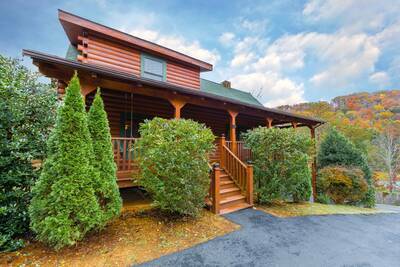 If you’re looking for the perfect Smoky Mountain vacation getaway, this is it! Inside you’ll find luxurious amenities and delightful décor. With an inviting open floor plan, you’ll have plenty of space to kick back and relax. Inside the super cozy living room you’ll find a beautiful stone accented fireplace, flat screen TV and comfy seating. 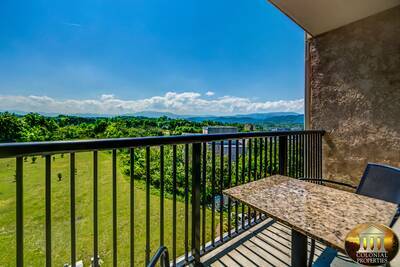 Nearby is the spectacular fully equipped kitchen where you can prepare, cook and serve a delicious meal while you’re on vacation in the Smoky Mountains. There’s also an intimate dining area that seats up to 6 people comfortably. If you’re in the mood for some fun and games, you’ll definitely enjoy challenging your friends and family to an exciting game of pool. There’s also 2 main level covered decks so that you can enjoy the great outdoors. For your convenience there’s also a half bath located on this level. Head downstairs and you’re greeted by a truly amazing space. Here you’ll find 2 sleeping areas, one has a custom crafted log king bed and the other has a magnificent log bunk set. On the lower level there’s also a private deck, additional living area with flat screen TV and a fabulous full bath. Take a stroll to the upper level of A Beary Nice Cabin and you’ll enter the amazing master suite bedroom. This entire floor is dedicated to your total comfort and relaxation. You’ll love the custom king sized bed, huge bedside jetted tub, flat screen TV, your very own private deck, sitting area and full bath. For a truly rejuvenating experience, you’ll definitely want to take a minute and soak in the bubbling outdoor hot tub to help sooth your mind, body and soul. Don’t forget to pack along your laptop, tablet or smart device so that you can enjoy the complimentary wifi internet at A Beary Nice Cabin. 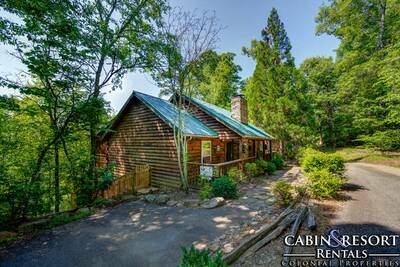 This beautiful Pigeon Forge vacation log cabin is perfectly located near shopping, dining, attractions and countless things to see and do. If you’re looking for a spacious, inviting and relaxing Smoky Mountain vacation getaway, then you’ll love your stay at A Beary Nice Cabin. Reserve your stay today! A: Hi Dawn! There are no mountainous roads to get to this cabin. A: Hi Jenny! Yes there is. A: The main Parkway is about 5 minutes away. “ Very nice and clean. Exceeded expectations. We had a wonderful stay and we will be back! “ We always enjoy our stays with Smokey Mountain rentals. Feels like our own personal getaway! “ Our stay was great and the cabin was very nice and clean. We loved the location and being close to just about everything. The kids loved the little creek out front and liked watching the frogs. We had a wonderful time and were very pleased with our cabin. “ The cabin was nice and clean. “ We had an awesome stay. Loved the cabin.. Great location to everything. Easy to find. Local to everything but also easy to get around the traffic if you want too. Excellent bed comfort! Easy Sunday Check out. 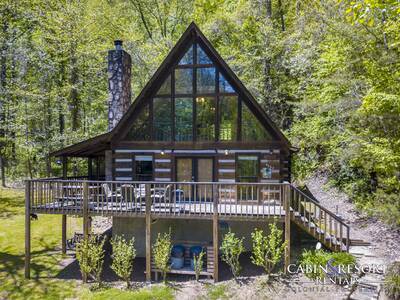 “ The cabin was very nice and decorated well. I enjoyed having the pool table and also the hot tub which we used 2 nights. Also loved having the jacuzzi in our bedroom. Overall it was a very pleasant experience. “ THIS WAS AWESOME MY Family and I really enjoyed. Our only regret is that we didn't stay longer. You can guarantee we will definitely be back again and soon..
“ My family stayed in A Beary Nice Cabin over Spring Break. It was myself, my husband, our 3 children, and my mother. The kids loved the Pool table and Arcade games at the cabin. The fact that all of my children and my mother could all stay in on ehuge room together, with more than enough room for all to be comfortable, was great! Especially being in a new and strange place, made it very easy on the kids. We genuinely loved this cabin and plan to return in the future. Its close enough to everything but far enough to be a quiet and peaceful stay. About a 5-10 minute drive from all of the attractions. The beds are comfortable and the fact that you could control the temperature on each of the 3 different levels with the added wall unit was perfect as the 3rd floor tended to be more warm and the bottom more cold than the others. “ Our stay was great. “ It was exactly how it looked in the pictures! We were extremely happy with the whole experience and would definitely use it again. 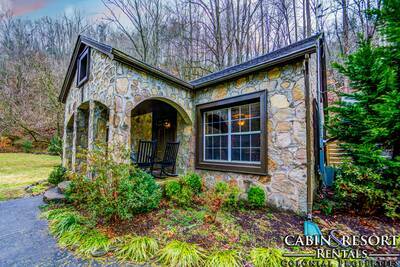 “ This is our fourth year renting with Colonial Properties and the cabin we rented was wonderful. The staff is always so friendly and helpful. We have been staying in a different cabin each year and all of them have been to our liking. The one this year was on a totally different floor plan than the others and we enjoyed it so much. Oh, yes the location was great also (only 3 or 4 minutes to Wal-Mart), what is a vacation without Wal-Mart. “ Cabin was very nice and clean, very roomy, enough room for two families, would definitely stay there again. “ Our experience was great very happy with accommodations very clean and close to everything had a great time. “ My entire family enjoyed our getaway immensely. The cabin was very cozy and comfortable. We will definitely visit again. “ We stayed with Colonial Properties in November of 2011. Our cabin was called A Beary Nice Cabin...and it was great!! The location was great, close to everything yet quiet and not crowded. It was clean and neat and everything was provided. We has a wonderful stay and will definitely be back!! “ I want this cabin again , definitely !!!! I had a great experience there !!! Real clean place , everything is space just right !!! I'm definitely coming back !!! Thank you !!! “ Thank you very much for a quiet and peaceful stay! 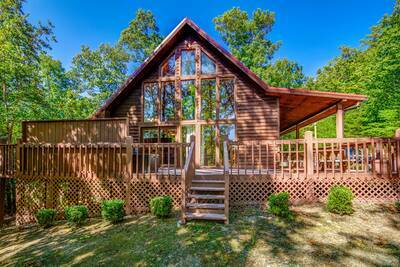 “ The cabin was very nice and was in a great location!